Today as part of my testing of a new antenna I took my FT 817 out to the park and decided to check into the Ontario ARES HF Net to see how things would work on 40m and show some support for ARES from the NTS. For this test remember I was operating QRP at the 5w SSB setting and I was testing out a Hamantenna CN32 Horizontal antenna. Now before you ask… The above picture is from their advertising and its not me on the mountain top. I was operating from a Picnic Table in a City of Ottawa Park. However the picture does show you that the antenna is a “Buddipole Style antenna” so now you have an idea of what I was talking about. Concidering band conditions and I was QRP I was able to check in with the Net Control Station in Deep River Ontario and hear all of the participants but some of them had trouble hearing me. This does not come as a shock but its good to know that if needed the contacts could of been made. Maybe next time bringing my QRO Radio out with the same antenna might be a good thing but at least they know that someone from the Ontario Phone Net took the time to check in to their net as a show of support. Perhaps when we change back to our winter hours some of them will repay the favour and check in with us. 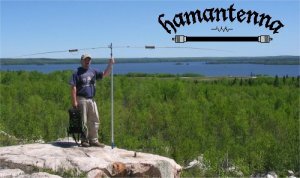 One drawback is that the Hamantenna is only a 2m to 40m antenna so I was unable to load up on 80m so I did miss the 2nd region net on 3.925 at 1345 hours. This entry was posted on February 28, 2010 at 8:49 pm and is filed under NTS. You can follow any responses to this entry through the RSS 2.0 feed. You can leave a response, or trackback from your own site.